Have you ever had a client relationship go bad? Needless to say, you’re not alone. When you’ve got an online business, it can sometimes feel even harder to make sure there’s no miscommunication because you’re mostly restricted to communicating via email. You can’t exactly walk down the office corridor and ask a question if you’re stuck on your client’s project. That means, you need to know how to write crystal clear emails that your client can’t possibly misunderstand – because misunderstandings go south way too quickly. And no one wants an unhappy client. Good client emails help you stay on message, keep projects running smoothly & make your clients think you’re a brilliant investment. When that happens, it’s infinitely easier to get referrals to keep your client pipeline full too. Here are my best tips on how to communicate with your clients via email. It’s so easy to think that the things that come incredibly easy to you will also be clear and easy to your clients. But they’re definitely not as clear as you think. Don’t assume that the client will know what such-and-such terminology means. Explain it to them. It helps them see you as a professional & builds trust in your expertise. People who do done-for you services, like copywriters, designers & developers, can suffer from this one a lot. We can tend to assume that clients will inherently respect our expertise and never question us. But that’s rarely true. A little known fact about writing bullet points in your web copy is that the brain is trained to remember the first, second and last thing on the list. In other words, you want to have the most important bullet points at number 1, 2 and last position. But if I do that for a client, will they automatically know that? Nope. I could save a bunch of time by not assuming the client will inherently trust my professional expertise (and bullet ordering skills) & give her a reason to trust me. And that can be as simple as a quick note that explains where we want the most important ones to appear on the bullet points list. This follows on from #1 above. Don’t assume that they’ll understand why you did something in a particular way. Use the opportunity to demonstrate your expertise & clarify what you’ve done and why. Pretend for a moment that you’ve just hired a web developer to help build your new website. How would you feel if your developer changed something that you’d agreed on and just sent it to you with a quick email that said something like, “Here it is”? I’ve been working on that XYZ that we agreed on, but I’ve found an alternative solution that may make it easier for you to maintain on your own. If we do it that way we originally planned, it’ll look great visually, but you’d have to get me to make changes for you if you ever want to change it. That’s fine by me, but it would add to your ongoing website maintenance costs. On the other hand, if we do it the way that I’ve demonstrated in the attachment, it’ll look a bit different than we had planned, but you’d be able to maintain it on your own. Changes would take you less than 2 minutes to make and you could make changes as often as you need. Naturally, it’s up to you. But I strongly recommend we go with this new approach, especially since I know you want to be able to maintain the site on your own as much as possible. That kind of email builds a lot of respect for your expertise and helps get the client on board with your proposed approach. Plus, it shows that you respect her opinion, which clients love. It makes it feel like you and your client are on the same team. If you’re ever thinking, “hmmm not sure what the client will think of this,” then take the time to explain your thought process. They’ll respect you for it & it’ll be much easier to bring them around to your point of view. One of the biggest mistakes I see is that people send a client an email that simply says something like, “here’s that deliverable you paid me for.” And that’s all the email says. Let’s imagine that you’re a graphic designer and you’ve delivered a client’s logo options via email. Don’t just write an email that says, “here’s your draft logo.” Take the opportunity to provide some clarity & map out the next steps. So, what’s the next step for the client? If they have to pick one version to move forward with, tell them that. If they need to get their feedback to you by Friday, remind them of that. If they get two more rounds of revisions, remind them of that too. It’s incredibly hard to keep projects on track if you’re NOT constantly reminding your clients of the next steps. And the longer a project goes, the harder it is for you to start on & complete the next one. You may have mapped out your process or your project milestones in other places, but you need to constantly remind the client of what they have to do & what’s next, every step of the way. They won’t remember what they read in those other documents after weeks have passed and the project has moved forward. You’re a professional and that means you’ve got to take responsibility for your client projects. Even if you’re dealing with the most annoying client of your life, never point the finger at them. Ugh. What a total waste of time. Be a professional and don’t try to lay the blame. Stay as neutral as possible. Graciousness goes a long way. Following these tips also helps prevent you ending up in a situation where miscommunication has happened so frequently that it just feels like you & your client are adversaries because you aren’t on the same page anymore. Here are 3 potential options for your draft logo. As you know from your client welcome pack, you get to pick one of these to move forward with and we’ll do 2 rounds of revisions to get it just right for you. To keep the project on track for your launch date, your feedback is due on Friday. After that, I’ll have the second round of revisions back to you in 3 working days. Great progress today. Congratulations on all the hard work you’ve put in to get to this point. You should be really proud of yourself. If you get stuck on anything between our sessions, you can always email me and I’ll talk you through it. You’re not alone. 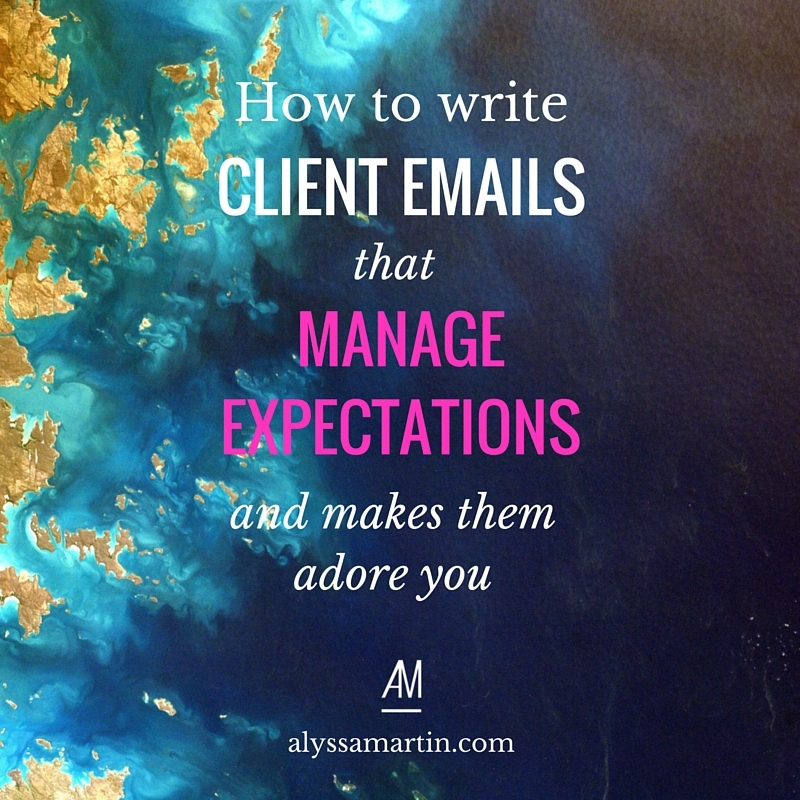 Do you find it hard to write emails that manage your clients, set boundaries & keep your client projects on track? I have a little secret that helps me keep my clients happy & keep my projects on track all at the same time. I have all my standard responses to the typical things that happen written up & saved in my canned responses in Gmail. So whenever something happens, I don’t have to faff about trying to figure out what to say. I just go to the template & edit it to suit the current situation – which takes soooo much stress out of the situation. I have all of my email scripts available for you too if you want to implement the same approach & save yourself some hassle. It’s a digital toolkit called, How Should I Say That? : 15 Email Scripts for Hassle-free Client Relationships & Keeping Projects on Track.